A gamepad, also known as a joypad, is held in both hands with thumbs and fingers used to provide input. Gamepads can have a number of action buttons combined with one or more omnidirectional control sticks or buttons. Action buttons are generally handled with the digits on the right hand, and the directional input handled with the left. Gamepads are the primary means of input on most modern video game consoles. Due to the ease of use and user-friendly nature of gamepads, they have spread from their origin on traditional consoles to computers, where a variety of games and emulators support their input as a replacement for keyboard and mouse input. Most modern game controllers are a variation of a standard gamepad. Common additions include shoulder buttons placed along the edges of the pad, centrally placed buttons labeled start, select, and mode, and an internal motor to provide haptic feedback. A Racing wheel, essentially a larger version of a paddle, is used in most racing arcade games as well as more recent racing simulators such as Live for Speed, Grand Prix Legends, GTR2, and Richard Burns Rally. While most arcade racing games have been using steering wheels since Gran Trak 10 in 1974,  the first steering wheels for home systems appeared on fifth-generation consoles such as the PlayStation and Nintendo 64. Many are force feedback (see Force Feedback Wheel), designed to give the same feedback as would be experienced when driving a real car, but the realism of this depends on the game. They usually come with pedals to control the gas and brake. Shifting is taken care of in various ways including paddle shifting systems, simple stick shifters which are moved forward or back to change gears or more complex shifters which mimic those of real vehicles, which may also use a clutch. Most wheels turn only 200 to 270 degrees lock-to-lock but some models, such as the Logitech Driving Force Pro, Logitech G25 and Logitech G27 can turn 900 degrees, or 2.5 turns, lock-to-lock. The Namco Jogcon paddle was available for the PlayStation game R4: Ridge Racer Type 4. Unlike "real" video game steering wheels, the Jogcon was designed to fit in the player's hand. Its much smaller wheel (diameter roughly similar to a soda can's) resembles the jog-and-shuttle control wheel used on some VCRs. The Nintendo Wii game Mario Kart Wii is bundled with the Wii Wheel: a steering wheel-shaped shell that the Wii Remote is placed inside thus using the Wii Remote's motion sensing capabilities to control the kart during the game. Hori also has a steering wheel that is made for the Nintendo 3DS game Mario Kart 7. When the steering wheel is placed on the back of the console, then it will have the same ability as in Mario Kart Wii by using the gyroscope in first-person mode. Pedals may be used for driving simulations or flight simulations and often ships with a steering-wheel-type input device. In the former case, an asymmetric set of pedals can simulate accelerator, brake, and clutch pedals in a real automobile. In the latter case, a symmetric set of pedals simulates rudder controls and toe brakes in an aircraft. As mentioned, most steering wheel controllers come with a set of pedals. There are also variations of the pedal controller such as the proposed rotating pedal device for a cycling game, which relies on an ergometer to generate user inputs such as pedal rpm and pedal resistance. A variation of this concept surfaced in 2016 when a startup called VirZoom debuted a set of sensors that can be installed in the pedal and handlebars, turning a physical bike into one controller for games on the HTC Vive and Oculus Rift virtual reality (VR) platforms. The same concept is behind a product called Cyber ExerCycle,  which is a set of sensors attached to the pedal and connected to the PC via USB for bicycle simulation games such as NetAthlon and Fuel. A touchscreen is an input device that allows the user to interact with the computer by touching the display screen. The first attempt at a handheld game console with touchscreen controls was Sega's intended successor to the Game Gear, though the device was ultimately shelved and never released due to the high cost of touchscreen technology in the early 1990s. The first released console to use a touchscreen was the Tiger game.com in 1997. Nintendo popularized it for use in video games with the Nintendo DS and Nintendo 3DS; other systems including the Tapwave Zodiac as well as Smartphones and the vast majority of PDAs have also included this feature. The primary controller for Nintendo's Wii U console, the Wii U GamePad, features an embedded touchscreen. Modern touch screens use a thin, durable, transparent plastic sheet overlaid onto a glass screen. The location of a touch is calculated from the capacitance for the X and Y axes, which varies based upon where the sheet is touched. One console that is touchscreen, but is not manufactured by Nintendo is Sony's PlayStation Vita which has a 5 inch OLED touchscreen. The Nintendo Switch features a 6.2 inch touchscreen. Motion controllers include the Sega Activator, released in 1993 for the Mega Drive (Genesis). Based on the Light Harp invented by Assaf Gurner,  it could read the player's physical movements and was the first controller to allow full-body motion sensing. However, it was a commercial failure due to its "unwieldiness and inaccuracy". 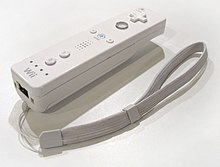 Nintendo's Wii system released in 2006 utilizes the Wii Remote controller, which uses accelerometers to detect its approximate orientation and acceleration and an image sensor,  so it can be used as a pointing device. The Sixaxis, DualShock 3, and PlayStation Move controllers for Sony's PlayStation 3 system have similar motion sensing capabilities. In 2010, Microsoft released the Kinect for the Xbox 360. This motion sensing controller uses cameras to track a players movement. Microsoft released a revised version of the Kinect with the launch of the Xbox One. This controller was bundled with the console on launch, and was removed from the default bundle in June 2014. Sony's EyeToy similarly uses cameras to detect the player's motions and translate them into inputs for the game. A light gun is a peripheral used to "shoot" targets on a screen. They usually roughly resemble firearms or ray guns. Their use is normally limited to rail shooters, or shooting gallery games like Duck Hunt and those which came with the Shooting Gallery light gun. A rare example of a non-rail first person shooter game is Taito's 1992 video game Gun Buster, a first-person shooter that used a joystick to move and a light gun to aim. Though light guns have been used in earlier arcade games such as Sega's Periscope in 1966  and Missile in 1969,  the first home console light gun was released for the Magnavox Odyssey in 1972; later on, Nintendo would include one standard on their Famicom and NES, called the NES Zapper. Nintendo has also released a "shell" in the style of a light gun for the more recent Wii Remote called the Wii Zapper which comes bundled with the game Link's Crossbow Training. A Rhythm game accessories used for rhythm games can resemble musical instruments, such as guitars (from 5-button guitars in Guitar Freaks, the Guitar Hero series, the Rock Band series to real guitars in Rock Band 3 and Rocksmith), keyboards ( Rock Band 3), drums ( Donkey Konga, Drum Mania, the Rock Band series and the Guitar Hero series), or maracas ( Samba de Amigo) have also seen some success in arcades and home consoles. Other rhythm games are based around the art of Djing or turntablism ( DJ Hero), or playing a synthesizer ( IIDX) using a turntable shaped peripheral with buttons. This page is based on the Wikipedia article Game controller; it is used under the Creative Commons Attribution-ShareAlike 3.0 Unported License (CC-BY-SA). You may redistribute it, verbatim or modified, providing that you comply with the terms of the CC-BY-SA.